The crumbling towers of Lahori Gate at the entrance of Qila Sarai at Sultanpur Lodhi. The police station and DSP's office continue to function from here. 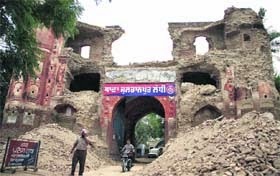 Ten days after the crumbling of one of the two ‘minars’ (towers) of Lahori Gate at the entrance of historical Qila Sarai at Sultanpur Lodhi on Thursday last, the authorities concerned are yet to wake up to the cause. Heaps of debris that lie at the entrance of the gate presents a picture of neglect on the part of the heritage and tourism authorities towards the significant archaeological monument. The monument dates back to 800-year-old Lodhi dynasty and its two gates, Lahori Gate and Delhi Gate (which lies permanently closed on the back side), were part of the erstwhile GT Road. Mughal emperor Shah Jahan is learnt to have rebuilt it. It was here that his sons Aurangzeb and Dara Sheikoh took up their studies. 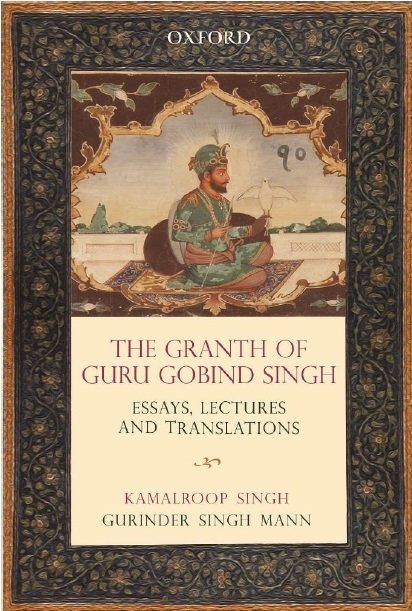 Guru Nanak Dev is also learnt to have spent time here. The fort currently houses the Sultanpur Lodhi police station and the DSP’s office. The partially broken Lahori Gate is the only access point for the scores of police employees and residents coming here daily. Even after Thursday’s incident, the police vehicles continue to pass through the gate, shaking its fragile structure every now and then. Onlookers say the life of the remaining part of the gate would not be much unless it is preserved at the earliest. As birds perched on it today, some loose bricks and dust started falling. “Any calamity, storm or even heavy rain may lead to the crumbling of the other ‘minar’, which seems to be losing its balance now,” says Sonu, a trader who has his shop opposite the building. In August 2008, a conservationist group, The Anad Foundation, led by prominent vocalist Bhai Baldeep Singh, had even presented a proposal for restoration of the two gates and the fort to Chief Minister Parkash Singh Badal. They had prepared an estimate of Rs 7.2 crore, but the government continued to turn a blind eye. For the commoners, the fort and the gate seem to have become irreparable, though conservationists believe otherwise. “There is no monument that cannot be restored. It only needs the mind and hands of an expert. The collapsed portion can be reconstructed by experts,” says US-based Harjap Aujla. Kapurthala Deputy Commissioner DS Mangat says he would get in touch with the officials and apprise them of the situation.